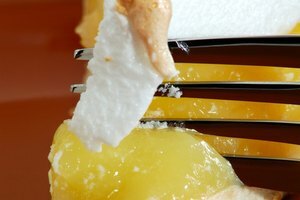 The meringue topping on lemon meringue pie creates the most satisfaction when served fresh and fluffy, and the most suffering when served thawed and rubbery. The egg whites in meringue don't freeze well, and develop a rubbery, chewy consistency when frozen and thawed. Avoid this meringue mess by freezing everything but the meringue. Meringue takes only a few minutes to make, so you can simply whip up a batch after the pie thaws and then caramelize it in the oven just before serving. 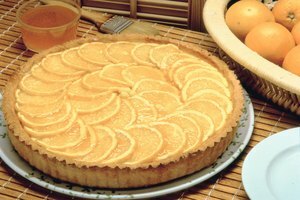 Complete the recipe until the point you add the meringue, just after you pour the warm lemon curd in the pie shell. Let the pie cool to room temperature. Place the pie in the freezer uncovered. Let the pie freeze solid, about 2 hours. Take the pie out of the freezer and wrap it twice with plastic wrap. Place the wrapped pie in a heavy-duty freezer bag. Mark the date on the bag and store it in the freezer up to 3 months for best quality. Let the pie cool to room temperature if it's still warm. Place the pie or pieces of leftover pie in the freezer. 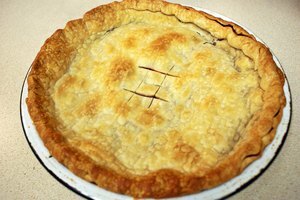 Allow the pie to freeze through; about 2 hours for a whole pie and 45 minutes for each quarter of a whole pie. Take the pie from the freezer and slide it into a heavy-duty freezer bag. Mark the date on the bag and store it in the freezer up to 3 months for best quality. 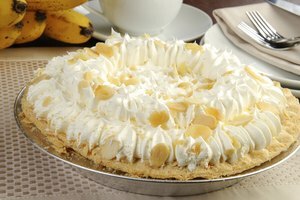 Remove the pie from the freezer about 2 hours before you want to serve it. Make the meringue and top the pie. Caramelize the meringue 6 inches below the oven broiler, about 3 to 4 minutes.